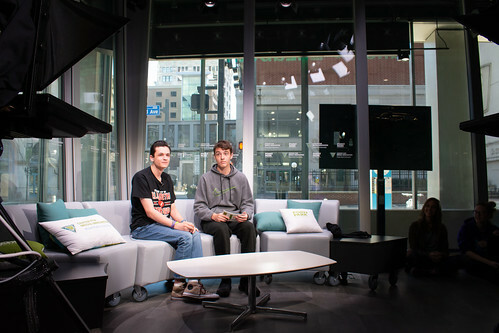 Point Park University's Center for Media Innovation and School of Communication hosted more than 150 students and teachers from 16 high schools in Pennsylvania and Ohio for the annual spring media day March 15 on campus. This year's theme was Raise Your Voice. "My favorite part was meeting students from other schools who have a similar interest in journalism," said Stephanie Kroll from Bethel Park High School. "There is still hope for journalism and there are people who care about getting the truth out." The day concluded with lunch and a keynote presentation from Chris Preksta, filmmaker and co-writer/director of the online sitcom Pittsburgh Dad.